The tall St. Lucian struck 121. In passing the three digit figure, Sammy 25, hit 14 fours and 3 sixes. His captain Rawl Lewis, with whom he shared a six wicket 104 partnership, contributed 54, and Andre Fletcher 38, as the Windwards replying to Barbadosâ 192, reached 303. When set 196 to win, Sammy led the way with 70 not out. Camilus Alexander made 37 and Johnson Charles 35. 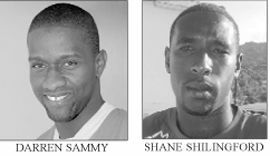 Corey Collymore took 3 for 45 and Kemar Roach 3 for 55, tried in vain as the Windwards held on. Shane Shillingford, the Windwards leading wicket taker this season took 3 for 35 in Barbadosâ first innings, and 6 for 57 in their second, to take his tally in eight matches to 36. Tino Best and Corey Collymore, both West Indiesâ discards grabbed 5 for 44, and 4 for 67 respectively, in the Windwards first innings total, as Patrick Browne held seven catches behind the stumps. When Barbados batted first, Kirk Edwards topscored with 64, and Browne made 58. Deighton Butler took 3 for 43, to complement Shillingfordâs efforts. Batting a second time, the host team scored 306. Edwards was again the topscorer with 107, Jason Haynes 55. Kevin Stoute 37. Sammy assisted Shilingford with 2 for 47. With this win the Windwards hurdled to second spot, with four matches in hand. Also scoring an outright win was front runner, Jamaica. A century by wicket keeper Carlton Baugh, who hit 129, as Jamaica posted 275.Tamar Lambert added 43. Imran Khan 3 for 22, Magnum Nanan 3 for 59 and Ravi Rampaul 2 for 20. In reply, Trinidad and Tobago was bowled out for 190. Adrian Barath made 58. Darren Bravo 41. Andrew Richardson 3 for 62, David Bernard Jr. 3 for 37 and debutant Jason Dawes 2 for 40. The Jamaicans totalled 285 in their second knock. Donovan Pagon 68. Wavell Hinds 57. Amit Jaggernauth 5 for 43 and Khan 2 for 49. Chasing 371 for a come from behind win, Trinidad and Tobago fell short by 121runs, dismissed for 249. Barath 71 and Bravo 70, as Richardson snared 5 for 55 and Nikita Miller 3 for 65, ensured that Jamaica extended their lead. And, in the battle of the bottom of the table, the Combined Campuses and Colleges made 254. Floyd Reifer 72, Jamal Smith 56 and Kyle Corbin 40. Veerasammy Permaul 4 for 72. Guyana responded with 497 for 7 declared. Narsighn Deonarine 198, Assad Fudadin 93. Travis Dowlin 51, Gajanand Sighn 43, and Sewnarine Chattergoon 40. Ryan Austin was the most successful bowler with 3 for 145. Batting a second time, the CCC was 67 for 1. No play was possible on the last day because of rain. The Windwards play the CCC this weekend here at the Arnos Vale Playing Field, with Barbados hosting Jamaica, and the Leewards away to the Guyanese.